And now for something completely different. I’m going to be writing about, of all things, surgical headgear that we wear in the operating room. Clean: These surgical wounds are uninfected and without preexisting inflammation, and tracts where bacteria might reside (e.g., respiratory, GI, GU tracts) are not entered. These wounds are closed primarily; i.e., stapled or sewn closed at the end of the procedure. Examples: Removal of skin lesions, mastectomy, thyroid surgery, hernia repair, splenectomy. Clean-contaminated: These are wounds in operations in which the respiratory, GI, or GU tract is entered, but in a planned, controlled fashion. There is no unusual contamination with the contents of those tracts, because they are entered in a controlled fashion and contamination is minimized. Examples: Cholecystectomy, small bowel resection, Whipple operation, gastric surgery, lung surgery, colon surgery. Contaminated: These wounds occur in cases such as dealing with open, fresh accidental wounds; cases in which there is a major break in sterile technique, gross spillage from the GI tract or acute nonpurulent (no pus) inflammation. Dirty: “Dirty cases” are, as you might imagine, quite dirty. They include, for example, old traumatic wounds with devitalized tissue; existing bowel perforation, infection, or even gross abscess. The point is that the gross contamination and organisms are present before the procedure begins. Examples: Incision and drainage of an abscess, repair of perforated bowel, peritonitis, wound debridement, and the like. The higher the surgical class, in general, the higher the risk of a postoperative wound infection. Or so surgical dogma has traditionally taught (more on that later). Also, in general, preoperative antibiotics are administered before cases that are class 2 (clean-contaminated) or above, and primary closure of the skin is generally not recommended for class 3 (contaminated) and above. As is true of so many things in medicine, the rules are not necessarily hard and fast, but this is the simple version taught to medical students. Also, determining what does and doesn’t work in terms of preventing SSIs has turned out to be not as easy as one would think. There’s a lot of dogma here, and recommendations have changed over the years. SSIs, not surprisingly, have become a focus of quality improvement, with great effort, particularly by the American College of Surgeons’ National Surgical Quality Improvement Program (ACS NSQIP®). I’d like to focus on just one controversy that’s been brewing over the last few years that (finally, I hope) has probably been resolved and in doing so have what I hope to be a fun change of pace from my usual rants. So today I will be discussing a fairly focused topic and a major study that was just published in the August issue of the Journal of the American College of Surgeons addressing a critical question: Bouffant vs Skull Cap and Impact on Surgical Site Infection: Does Operating Room Headwear Really Matter? In other words, does the choice of headgear to keep that nasty hair of yours away from the surgical field matter? (Spoilers: It doesn’t.) Before we get to the study, let’s take a look at the debate and its history. Surgical headgear: Skullcap versus bouffant? The skullcap: Lean, mean, and stylin’. As you can see, it’s basically a much looser-fitting cap with elastic to keep it on the head. Most older surgeons, particularly male surgeons, also detest it. Throughout my nearly 30 years as a surgeon (if you count my residency), I’ve used both varieties of caps. I tend to prefer the skullcap because it’s better-fitting for someone with short hair, and the bouffant cap tends to migrate on my head as I move around doing operations. The one downside to the skullcap is that it flattens my hair to the point that, when I come home after a day in the operating room, my wife sometimes makes fun of my “operation head”. 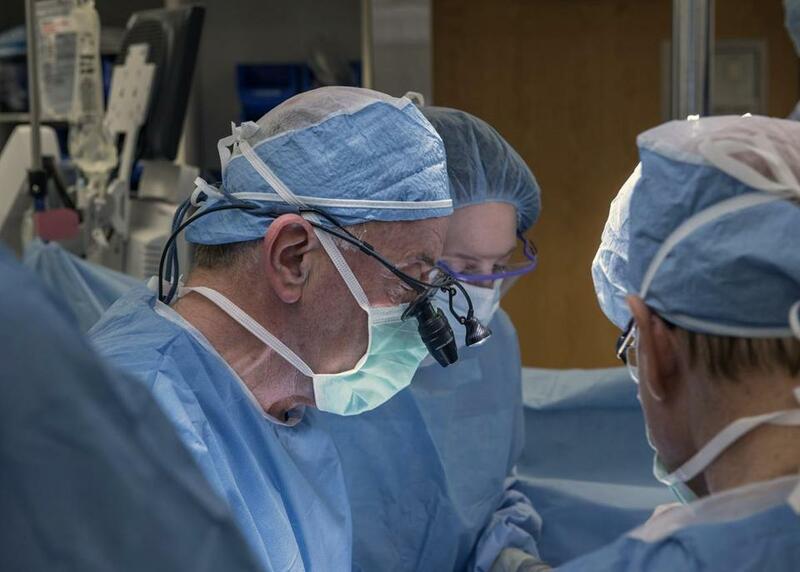 Surgeons for years have stepped into operating rooms wearing their surgical cap — a snug covering that ties in back and comes in standard-issue blue or hundreds of personalized designs. But a crackdown appears to be underway on that almost sacred piece of headgear. Inspectors in January reprimanded operating room staff at Brigham and Women’s Hospital in Boston for having the hair around their ears uncovered during surgery — and for sporting visible facial hair. And a New York surgeon was written up for showing 3 inches of hair at the nape of his neck. For sure, other operating room staff wear surgical caps, but they have long been the hat of choice for many surgeons. The problem is the hats usually leave small amounts of hair and the ears exposed — a situation that an influential nursing group says could promote infection. Regulators have taken the nurses’ concerns to heart, forcing some hospitals to switch to shower cap-like “bouffants,’’ which can be pulled down over a wearer’s entire head. To be honest, I’ve never really used a cloth skull cap in the operating room, and whenever I’ve seen a surgeon sporting one I always wondered when the last time it had been washed was. If such a cap, no matter how spiffy the design, hasn’t been washed after every one or two days of use, personally I couldn’t help but think: Ew. So instead, I wore the disposable paper caps. Basically, what we’re looking at here is an ongoing spat between the Association of periOperative Registered Nurses (AORN) and surgeons, represented by the American College of Surgeons. AORN guidelines in practice ban the skull cap and require the bouffant cap, while ACS guidelines state that skull caps with minimal hair exposure are acceptable. Why do I say the AORN guidelines ban the skull cap “in practice”? Continue reading and find out. 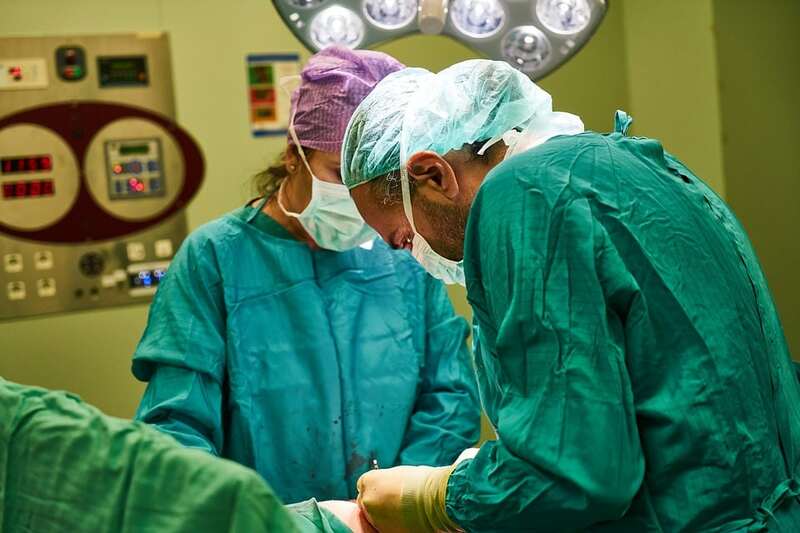 Soiled scrubs and/or hats should be changed as soon as feasible and certainly prior to speaking with family members after a surgical procedure. Scrubs and hats worn during dirty or contaminated cases should be changed prior to subsequent cases even if not visibly soiled. Masks should not be worn dangling at any time. Operating room (OR) scrubs should not be worn in the hospital facility outside of the OR area without a clean lab coat or appropriate cover up over them. OR scrubs should not be worn at any time outside of the hospital perimeter. OR scrubs should be changed at least daily. During invasive procedures, the mouth, nose, and hair (skull and face) should be covered to avoid potential wound contamination. Large sideburns and ponytails should be covered or contained. There is no evidence that leaving ears, a limited amount of hair on the nape of the neck or a modest sideburn uncovered contributes to wound infections. The ACS encourages clean appropriate professional attire (not scrubs) to be worn during all patient encounters outside of the OR. The skullcap is symbolic of the surgical profession. The skullcap can be worn when close to the totality of hair is covered by it and only a limited amount of hair on the nape of the neck or a modest sideburn remains uncovered. Like OR scrubs, cloth skull caps should be cleaned and changed daily. Paper skull caps should be disposed of daily and following every dirty or contaminated case. Religious beliefs regarding headwear should be respected without compromising patient safety. Indeed, among surgeons, much is made in this debate about how the skull cap is presumably the “symbol” of the surgical profession, and maybe it is—or was, at least when back when nearly all surgeons were men with short hair. These days, an increasing percentage of surgeons are women, most of whom presumably have longer hair and can’t use a skull cap because it doesn’t cover their hair adequately. To argue in 2016 that the skull cap is the “symbol” of the surgical profession revealed a blindness to the reality of surgery today. Maybe the skull cap was once the “symbol” of the surgical profession, but I would argue that, even if that was once the case, it shouldn’t be any longer. Stick to the evidence and not some emotional attachment to the days of yore, when men were men and women, by and large, were not surgeons. Also, most of the people in the operating room are not surgeons. There are nurses, scrub techs, anesthesiologists, nurse-anesthetists, and the like. They probably don’t care if the skull cap is a “symbol” of the surgical profession. Yes, we surgeons tend to think we’re the center of the universe. Wearing a particular head covering based on its symbolism is not evidence-based, and should not be a basis for a nationwide practice recommendation. Several types of evidence exist that support recommendations that perioperative personnel cover their head and ears in the OR. This evidence includes the fact that human skin and hair is naturally colonized with many bacteria, and perioperative personnel shed microorganisms into the air around them. We know airborne bacteria in the OR can fall into the operative field, contribute to the overall air contamination of the OR, and place patients at risk of surgical site infections. Completely covering the hair can reduce the number of bacteria introduced into OR air by perioperative personnel. I’d say that the ACS needs an icepack for that burn, compounded by AORN’s other retort that, “until an evidence-based definition of ‘limited’ or ‘modest’ can be determine[d], there is no way for facilities to enforce such a recommendation” that only “limited” hair can be left uncovered. However, despite invoking “evidence-based” definitions, notice that AORN didn’t cite any actual…oh, you know…evidence to show that wearing surgical skull caps is associated with an increased SSI rate. It makes a not unreasonable argument in terms of how the skin and hair are colonized with bacteria and how surgical personnel can shed them. However, that’s an argument that pretty much relies on prior probability. Yes, it’s not unreasonable to point out that exposed hair might shed bacteria onto the surgical field. However, surgeons used to do a lot of things to decrease SSI rates based on ideas that seemed to make sense at the time but were later found in controlled studies either to make no difference or to be counterproductive. Extensive shaving of the surgical site, particularly the night before, comes to mind. Nowadays, we don’t shave surgical sites unless there’s a lot of hair, and then we only just use clippers to cut it very short right before surgery, right before the surgical prep with antiseptic solution. There was at the time of AORN’s recommendations basically no evidence suggesting that choice of surgical headgear influences SSI rates. Even the Boston Globe story noted that two large reviews of published studies in the last five years before 2016 showed little or no evidence that surgeon surgical headgear choice affected SSI rates. It also noted AORN’s argument that there can’t be any randomized controlled trials because such a trial “would potentially expose patients to the risk of infection from health care workers whose skin and hair were uncovered…” I agree that such a study would be impractical, but not for that reason. There is what I would call genuine clinical equipoise in the question; we honestly didn’t know if headgear made a difference in SSI rates and the evidence to that point suggested that it probably did not. AORN was way off-base in claiming that such a trial would be unethical because of lack of clinical equipoise. The real reason it would be impractical is because no one would want to agree to be randomized to one type of cap or another. Logistically, such a study would be a nightmare. And that’s what’s happening all over the country. The OR leadership in my own hospital declared that skull caps would no longer be allowed, again, based on no evidence. Amusingly, AORN is a bit annoyed at this whole controversy. Indeed, last year, it issued a statement denying that its guidelines ban the use of skull caps. It pointed out that the 2014 guidelines stated, “A clean surgical head cover or hood that confines all hair and completely covers the ears, scalp skin, sideburns, and nape of the neck should be worn.” AORN bases this recommendation on the observation that hair can harbor bacteria that can potentially fall into the surgical field. Indeed, AORN took great umbrage at the suggestion that it has “banned skull caps” in its statement, lamenting how its position had been “misrepresented” in media reports. If this PowerPoint presentation on the official AORN template on getting rid of the skull cap and advocating for bouffant caps instead is any indication, AORN was most definitely advocating for getting rid of the skull cap. Approximately 300,000 surgical site infections (SSIs) occur each year, accounting for approximately one-third of hospital-acquired infections.1, 2, 3 Many factors contribute to this, including surgery type, glucose control, and patient body temperature. Recent attention has been given to the type of headwear as a risk factor for SSIs. Little research is available on the efficacy of various head covers in reducing the incidence of SSIs. Despite the lack of clear evidence, there is an ongoing disagreement over which form of head cover should be recommended in the perioperative setting. The American College of Surgeons guidelines indicate that skull caps with minimal hair exposure are acceptable, and the Association of Perioperative Registered Nurses recommends bouffant caps with coverage of all hair. In addition, they recommend covering the ears, sideburns, scalp, and nape of the neck, on the basis that hair and skin in these sites are known to harbor bacteria that can be dispersed.4, 5, 6, 7 However, no scientific evidence has shown a significant advantage in SSI reduction with either cap. This study aimed to determine the influence of surgical cap choice on SSI rates by comparing the incidence of SSIs based on attending surgeons’ use of skull caps or bouffant caps in the perioperative setting. So how did the investigators, led by corresponding author Shanu N. Kothari, MD at the Gundersen Health System in La Cross, WI, approach this problem? Basically by reanalyzing data from a large randomized controlled trial that looked at whether clipping hair at the surgical site affected SSI rates. (It didn’t, by the way. The only reason we tend to clip hair these days is for convenience when there’s a lot of it.) Basically, data from this randomized study were re-analyzed to determine the impact of surgeon preference for bouffant vs skull cap, regardless of whether hair was clipped or left intact. In brief, patients were grouped based on the attending surgeons’ headwear, and the primary end point was SSI observed. Additional variables included preoperative comorbidities, operative approach, and procedure type. Overall, there were 1,543 patients in the analysis, with attending surgeons wearing bouffant caps in 39% of the cases and skull caps in 61% of the cases. The authors found that patients whose surgeons wore a bouffant cap tended to be slightly older, have a lower BMI, and were undergoing primarily hernia/other procedures. Six patients in both the bouffant and skull cap groups had a history of colonization with methicillin-resistant Staphylococcus aureus (MRSA). Use of perioperative antibiotics were the same in both groups. The raw numbers showed that SSIs were observed in 96 (6.2%) of patients, with 8.1% in the bouffant group and 5.0% in the skull cap group. However, after adjusting for the type of operation and surgical approach in a multivariate logistic regression model, no difference in SSI rates for skull cap versus bouffant cap was detected. The previous study data were biased toward male patients, as inclusion criteria consisted of adequate body hair to warrant hair clipping. Surgeon cap preference was linked with their specialty and procedure types. For example, the vast majority of foregut cases were performed by surgeons who preferred skull caps. In addition, although the head covering of the attending surgeon was known, we did not document the head coverings that other members of the surgical team wore. Also, the study was conducted in the setting of elective general surgical procedures and excluded vascular, anorectal, orthopaedic, obstetric, and gynecologic procedures. Analysis of cap material, including measures of pore size and comparison or particle counts, in addition to quantifying microbial sedimentation rate, were beyond the scope of this study. Despite those limitations, when taken in the context of the evidence base existing before this study was carried out, these data are yet one more strong piece of evidence that choice of surgical headgear almost certainly doesn’t matter and doesn’t impact SSI rates. As the authors note, this is consistent with what we knew before, and this study isn’t alone. For instance, a large retrospective study by Shallwani et al failed to find a statistically significant change in the SSI rate from 13 months before to 13 months after the new AORN policies. One aspect of the study above that led me to learn more about this issue is a recent publication by Bartek et al, “Naked Surgeons? The Debate About What to Wear in the Operating Room“, which was cited by the authors. This particular opinion piece with targeted literature review pointed out how steeped in tradition, rather than evidence, so many infection control procedures in the operating room are and how heterogeneous and conflicting the evidence is for many of them. It’s a fascinating read and appears not to be behind a paywall; I recommend it. On the topic of covering the arms, AORN recommends: “When in the restricted areas, all nonscrubbed personnel should completely cover their arms with a long-sleeved scrub top or jacket” . Interestingly, AORN’s recommendations and the United Kingdom’s NICE’s requirements are contradictory: As above, AORN recommends wearing a “long-sleeved scrub top or jacket,” whereas NICE’s policy is “bare below the elbows” [1, 22]. The fact that 2 large, guideline-producing bodies would recommend completely opposing practices under the rubric of evidence-based medicine is suspicious. Old studies looking at airborne bacteria show, among other things, that women wearing stockings shed more bacteria than women with bare legs . NICE took the stance that handwashing is what is key and clothing with sleeves does not affect bacterial colony counts, but that it could affect practitioners’ abilities to wash their hands. This conclusion too has been refuted . Perhaps some of my British colleagues who read this blog could chime in in the comments, but I must confess that I was amused by this controversy. Another set of studies reached an even more drastic conclusion: Naked men shed approximately a third to a half as many bacteria as the same men wearing street clothes or scrub suits [27, 28]. Perhaps “scrubs” actually live up to their name: rather than “catching” squames, which the skin sheds perpetually, they may in fact be “scrubbing” these bacteria-laden squames from our skin. If we are to adhere to the strict prescription of evidence-based medicine, ought we to disrobe prior to entry into the operating room? We argue no, although for reasons that are outside of how it would affect bacterial counts in the operating room. Who says there’s no room for humor in the peer-reviewed medical literature? There are other common practices that really don’t have a strong evidence base for them. (Some would even argue that the surgical site classification is lacking in that respect.) For instance, there is no evidence that wearing surgical masks prevents SSIs. Indeed, there’s even a Cochrane review that suggests otherwise, and Bartek et al point out that masks have never been shown to be effective in preventing SSIs. However, if your purpose is to protect the surgeon and others working on the patient from being splattered with blood in the mouth or nose, then requiring surgical masks makes perfect sense, just as requiring protective eyewear does. That’s likely why no one is proposing that we surgeons stop wearing them. Certainly, as someone who’s been sprayed in the face with blood many times over the years (although much less frequently and with much less volume ever since I restricted my practice to breast surgery), I’m grossed out by the thought of operating without a mask. The bottom line is that, although the reaction of surgeons and the ACS to the AORN recommendation struck me as rooted far more in emotion and tradition than anything else, the ACS did have a point. There was no evidence that choice of headgear has a significant impact on SSI rates, and there is no evidence that it does. In its response to the AORN guidelines ACS would have been better served by ditching the bit about the skull cap being a “symbol” of the surgical profession, which struck me as a callback to our more-than-a-bit sexist past, and sticking to the evidence. Similarly AORN would have done well not to overreach and extrapolate beyond what the evidence justified in its recommendations. Finally, I can’t help but conclude that this entire kerfuffle was an example of how the smallest disagreements all too often result in the most protracted fights. Are Russian bots being used to sow division over vaccines? Maybe. This is reminiscent of Gulliver’s Travels and the Big-endian vs the Little-endian controversy. Or we might think of Gabriel Chevallier’ great epic Chochemerle. As an aside, many years ago, large professional kitchens following the French tradition indicated ranks by the hats worn. IIRC, the bouffant surgical hat looks like the hat of a master baker. That’s similar to (but a bit less than) the amount of gear you have to wear for cell manufacturing. Just add in long sleeved (with wristbands) scrubs, suite-only shoes, shoe covers, boot covers, bouffant caps, mask, goggles, hood, two pairs of sterile gloves, and sleeve covers. And every time you leave you get patted all over with agar plates to make sure you were really clean. Ugh. The AORN’s argument is completely disingenuous. You can’t say you don’t ban skullcaps then insist on guidelines that skullcaps can’t meet. Just say you ban skullcaps and be done with it. Better yet, have the evidence to back up your argument. I thought you sported a beard nowadays. Naively, one might think that to be more concerning than a bit of hair at the nape of the neck. I do sport a beard these days, although I’m thinking of going clean-shaven again. Orac does fashion! And right before September too! I looked at surgical cap images ( bing) and found many unattractive selections however there seem to be intermediate options ( perhaps it may just be how the image is shown) where a tighter cap ( in the front) has a looser area in the back or an actual pouf ( I assume for long hair, pony tails). Quickly looking over the choices, and speaking strictly from a fashion viewpoint, those bouffants do look really awful and the skull caps appear much less bad. re beards: I would think that masks cover those up unless they are huge. OK. The hybrid caps look like they are bouffant caps with front bands sewn in. I still wish my dad had gone for the idea of starting a company to make designer compression stockings. There are a few lines of interestingly patterned compression socks for athletes. I wish there were more, and that the best ones didn’t cost $70. Then there’s us poor patients. When I had minor (day) surgery a few years ago everyone wore bouffant head gear: surgeon, anesthesiologist and nurses. It looked like we were in the kitchen of a restaurant. To my horror they put one on me as well. So much for being operated on in style. Apparently a baseball cap is frowned upon. And for a completely opposite perspective, when I was rolled in for a C-section, exhausted and more than a little scared, one of the OR techs was wearing a skull cap bearing the name of my favorite football team from my hometown (which is often spat upon by fans of their rivals in the city I’ve settled in). Being able to form a quick bond with someone based on a seemingly random aspect like personal choice in OR fashion really helped alleviate my anxiety and relaxed me both before and after the procedure. How about the Plague Doctor outfit? I remember seeing those in an episode of a series I watched when I was young and they scared the hell out of me. Speaking as a pediatrician, pass the popcorn!! Fear not Orac, the BIDMC surgeons have gotten their surgical caps back. Much blood was spilled in many meetings. I bet there was. Here at my hospital, we’re still stuck with bouffant hats. Hey, those aren’t pit hairs; those are head hairs. Besides, there are a lot worse things in surgical sites besides hair. I _really _ like the Plague Doctor outfits. Sometimes I am called into peripheral areas of ORs to render pathologist services and need to don headgear. Given a choice I always go for the disposable skullcap and not the dorky bouffant one. Hilarious to discover that nurses and surgeons have been duking it out over this. I think it’s silly because not everyone can get all their hair under a skullcap, but everyone can get their hair under a bouffant cap. Why supply two items when one will do for everyone? The bouffant caps look goofy. And they don’t always stay in place. I have to wear them on occasion when I go into some kinds of isolation rooms, or when we perform some kinds of surgical procedures in the ER (never a fun thing btw). I’m really glad I never became an OR nurse. Hate the gowns, the booties, the cap, but especially the mask. On a practical note: How do the two styles compare if the surgeon needs to wear a headlamp or binoculars with or without a headlamp? I would think the bouffant style might be a bit of a problem therewith. As for beards: Don’t I remember the docs of The Knick dipping their faces in basins of ??? Anther matter I’m curious about is towels. After careful scrubbing it seems a towel is the standard drying method. Is there a prescribed method for assuring that the use of a towel does not bring “dirty” water from above the scrub line down to the scrubbed zone? You’re supposed to wear a clean lab coat when you leave the OR, and all hospital workers are supposed to change their uniforms if they get soiled. Some hospitals even have scrub dispensers where you use your ID badge to check out a clean pair, and check in a soiled pair to the laundry. That’s necessary. A lot of hospital workers take OR scrubs home and never bring them back. I should know; I’m guilty of this myself. But the lab coats themselves aren’t always clean or even worn. I’ve seen that happen a lot. Or the staff don’t take their shoe covers off, and wear them to the cafeteria, then don’t change them when they return to the OR. I’ve seen that happen as well. Rules don’t work if you don’t follow them. The trick after you wash your hands is to go from hands to elbows and keep your hands above your elbow (anything that drops below the waist is considered contaminated). Out here doctors don’t wear lab coats so theatre scrubs/gowns ar a bit of a fashion statement (outside theatre minus the cap). One of our doctors used to wear his long theatre gown on rounds which is a no no (he put a new one on just for the rounds) until I told him I liked to see a man wearing a dress, after that he just wore his civies. Physicians have to make do with just a stethoscope as their badge. Weirdly, patterened scrub tops seem to have suddenly become popular among the 50+ black ladies in my neighborhood as fashion. ^ In age, that is. Yes, our (nurses) scrubs are standard across the state but on Fridays there is a competition to see who can wear the most outrageous patterns. Doctors are stuck with green if they work in ED but they are optional. A few years ago now, we had an imposter in ED (they worked him out quickly before he saw patients thank heavens) but when the nurses were asked why they assumed he was a doctor they replied, and I quote “ he was scruffily dressed and had an expensive stethoscope”! The bouffant vs. skullcap conflict is small potatoes compared to AORN’s claim of Bovie smoke toxicity and the need for expensive, unproven smoke mitigation equipment. AORN has even “partnered” with a commercial entity selling these devices and has initiated a Go Clear Award program. Although it’s purely anecdotal, I’m still vertical after decades of inhaling Bovie smoke and am considering a “Bovie Smoke Strong” award for those similarly situated. Excellent point. I hate, hate, HATE the stupid little vacuum devices they make us put on the Bovie and rip them off whenever I get a chance. It makes me crazy. The awkwardness of the device makes fine control of the Bovie so much more difficult. I just got treated to the sight of a bouffant and booties at the Starbucks near the local hospital. I mean, half of the customers are wearing scrubs that are trailing on the ground, but the production number almost got me to ask where they were going next. I encountered that once at a 7-11 and could not refrain from saying “Gross!” out loud. The bouffant and bootie crew didn’t seem to care, and the cashier was just resigned.